I have no idea what Heng Hwa food is until I was taken to Putien in Singapore for dinner. 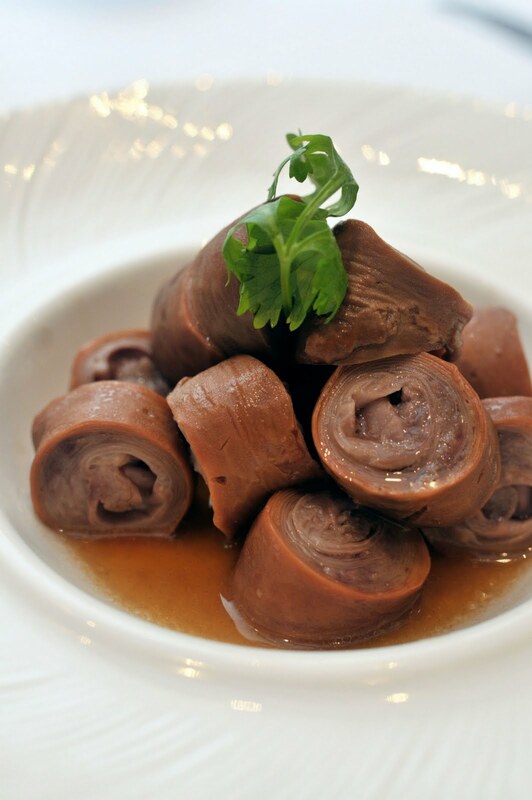 In Singapore, Putien restaurant is widely acknowledged as a pioneer of Heng Hwa cuisine. Founded by Heng Hwa native Fong Chi Chung, the sole modest eatery in Kitchener Road eleven years ago has now expanded to eight modern restaurants throughout the island state and one in Jakarta. A little bird twittered that Kuala Lumpur may be next. 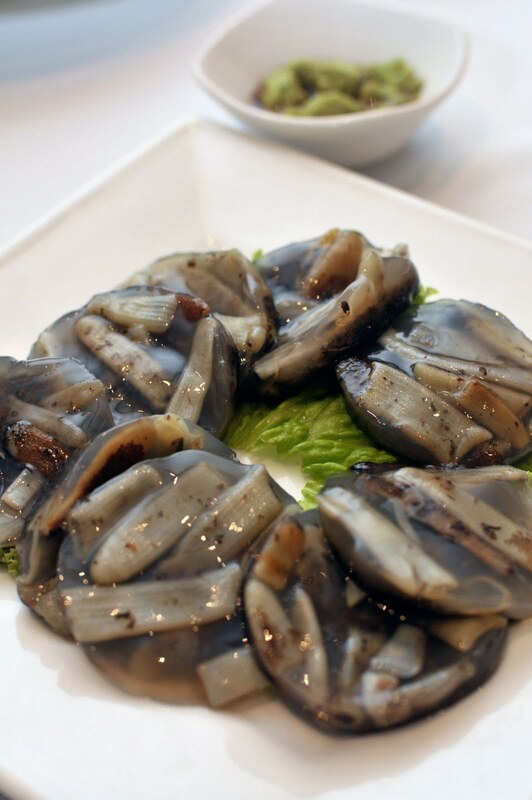 The restaurant is named after Putian, a coastal city in the Fujian province of China which is also the birthplace of Heng Hwa cuisine. Surrounded by the ocean and majestic mountains, the city is blessed with lush pastures and bountiful catches from the sea. Its homely, hearty fare emphasises on the innate goodness and purity of the main ingredients, with sauces and condiments used sparingly. Putien is evidently very popular with Singaporeans as the outlet was packed to the brim the evening we dined there. Its modern, cheery ambience incorporating the restaurant's signature muted turquoise-blue shade complements the refined but rustic offerings on the menu. Dunno about you but I love cockles! My late paternal grandfather had a penchant for these; we used to blanch tubfuls of them in hot water and relish them with sambal or freshly ground chilli dip. So the Drunken Cockles (SGD9.90++) at Putien certainly took me down memory lane. Their rich metallic accent is tempered by the sweet, mellow Chinese wine and bracing sharpness of minced garlic and bird's eye chilli. Yummy! 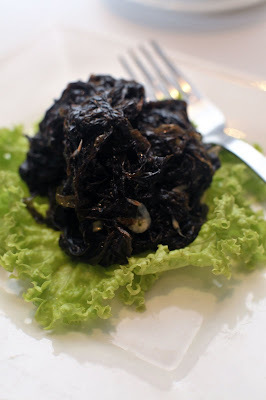 The Mini Shrimps with Seaweed (SGD9.90++) tasted like Japanese inari (sweet beancurd skin) but it was a shame that the tiny white shrimps barely made their presence felt amidst the subtly sweet-briny seaweed. I'm not big on pig intestines but the meticulously hand-stuffed ‘nine-fold’ Braised Pig Intestine (SGD13.90++) was pleasantly toothsome and richly flavourful from its braising liquid. Equally good was the crisp but fluffy savoury-sweet Stir-Fried Yam (small SGD 10.90++, medium SGD 16.90++, large SGD 21.90++). The slightly chewy discs were best enjoyed with the house chilli sauce. To cleanse the palate, we had some Iced Bitter Gourd (SGD 5.90++); dipping the long, crunchy and bitter strips in light honey sauce. I'm definitely getting on in age - I used to hate this vege! 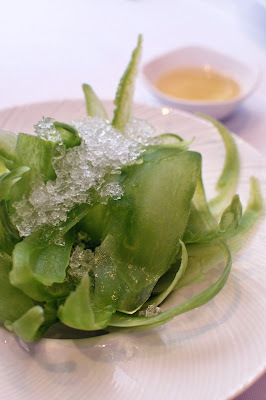 Putien also has a seasonal menu. 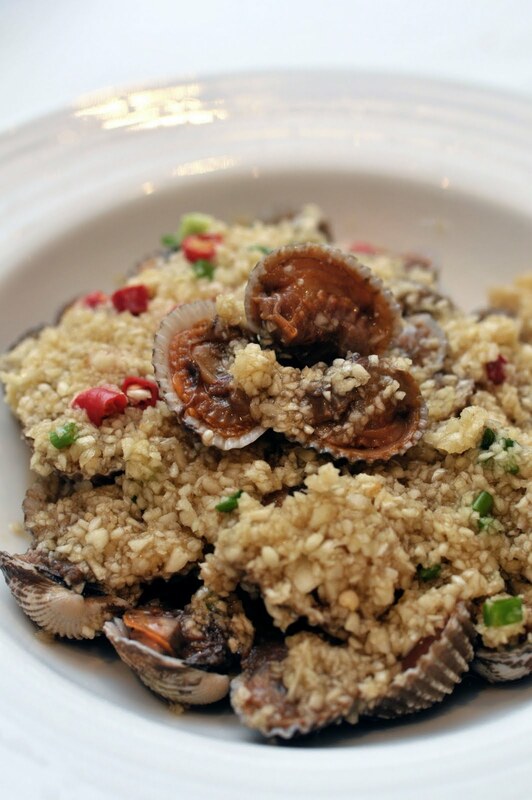 The arrival of spring means an abundant supply of bamboo clams from its namesake city. 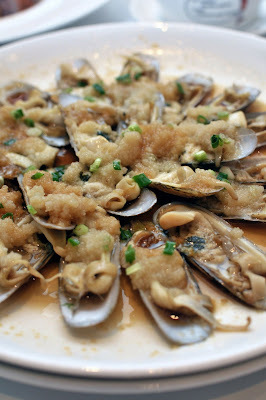 Larger and slightly longer than local la la clams, the Steamed Bamboo Clams with Minced Garlic (small SGD 19.90++, medium SGD 29.90++, large SGD 39.90++) came with enough pungent garlic to knock you out twice! But the juicy sweet clams were absolutely sublime! Scores of Singaporean 'floggers' have raved about the eatery's Lor Mee (small SGD7.90++, medium SGD15.90++, large SGD23.90++) – now I know why. The smooth, silky wheat noodles tasted somewhat like Hokkien mee suah. 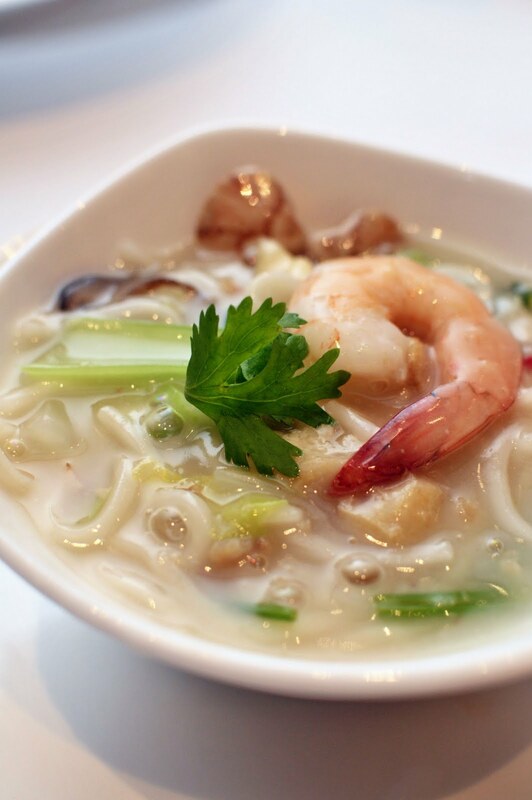 It's pure comfort food as the thick noodles come immersed in a thick, luscious soup laden with three-layered belly pork slices, la la clams, prawns, sliced black mushrooms, Chinese parsley and choy sum. 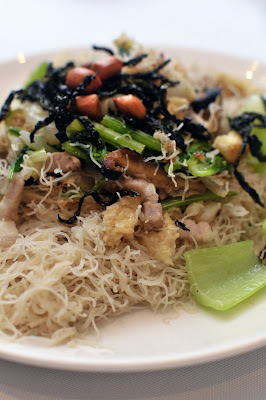 Another 'must have' classic is the Fried “Hing Wa” Bee Hoon (small SGD7.90++, medium SGD15.90++, large SGD23.90++) in which premium, super-fine rice noodles from Putian are deftly fried with peanuts, black mushroom slices, strips of beancurd puff, Chinese parsley, green vegetable and fried seaweed. Don't let its pale look fool you - the rice vermicelli is delicious. If you fancy some home-style soup, the Braised Beancurd with Chinese Cabbage (SGD 19.90++, SGD 29.90++, SGD 39.90++) served in a black earthenware pot should go down well. You'd find handmade beancurd puffs, Chinese cabbage, clams, dried shrimps and dried scallops in the sweet, milky-white broth. 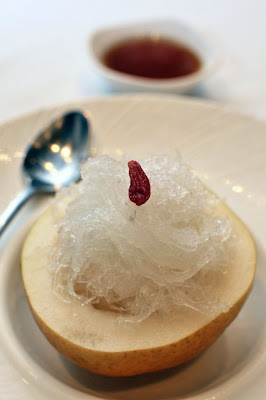 We rounded up with Chilled Bird's Nest with Pear (SGD36.90++ per person) – a luxurious mound of the gelatinous strands perched atop half a Chinese snow pear, drizzled with honey sauce. A perfect end to our rustic yet refined evening. @Food Dreams - you will have the opportunity real soon! I got wind that Putien plans to open in KL later this year. Oh ! love those cockles.